I struggle with “branding.” I struggle with naming things. I took the easy way out when I had a photography business. I just used my first and middle given names, partly as tributes to my two grandmothers for whom I am named. Mama and Daddy gave me my grandmothers’ middle names. Then I had to name my blog. And I thought and thought. I ended up with Telling Stories because I believe that our stories need to be told—the good ones, the bad ones, the funny ones, the embarrassing ones, and even the tragic ones. We have to tell our stories. I use words and images. Whether it’s because I am in the last year of my fiftieth decade (next year I will be sixty), or whether it’s because people I always believed would be around forever are passing away, or what, I am thinking about stories. Every so often I purchase one month of Ancestry.com to dig more into my family’s history. I have discovered through the stories my parents have told me, and my grandparents, that I have great-great-great-great-etc.-grandparents and –uncles who fought in the American Revolution, the War between the States (aka the War of Northern Aggression), and every war through the Vietnam war. My father is a World War II veteran who was drafted near the end of the war and trained to serve in the Pacific theater. However, a week before he graduated boot camp the Japanese surrenders, and his ordered changed. He was sent to serve in occupation Germany with the peace-keeping forces. My mother’s younger brothers were drafted during the Vietnam era, but neither of them went to Vietnam. Uncle Lee served in Spain. While I was poking around in Ancestry.com Sunday night, I found the family tree that my first cousin is putting together. I asked if I could access her tree, and she graciously invited me in. She had uploaded the most wonderful picture of my maternal grandmother. Grandma, Georgia Olivia Helmley Wessinger, was born in Rincon, Georgia, the thirteenth of thirteen children. She had nephews older than she was! (Can you imagine that in happening in 2017?) She learned to make tatting when she was six years old from the school teacher who boarded with her family. Grandma tatted until she could not longer see the fine thread and knots she made with her shuttle. Her work was gorgeous! Absolutely beautiful! When I was growing up, my sister, and later my brother, and I would spend a week with Gramma and Granddaddy. During those summer weeks, I don’t think I ever saw her wear anything but cotton print shirtwaist dresses, even when she went out to work in the garden in the mornings. And she never wore blue jeans! My other grandmother wore long pants and pedal pushers when she worked out in the yard, just like my mama. But never Granma! So, who is that pretty young lady in the picture? That is my grandmother when she was single, living in Rincon, in the 1920’s. One of the stories told about her is that she drove the car for her pastor because both he and his wife were elderly. One day, he wanted to take his brothers and sisters to Tybee Beach in Savannah. His nephew had driven his aunts and uncles to visit their brother. 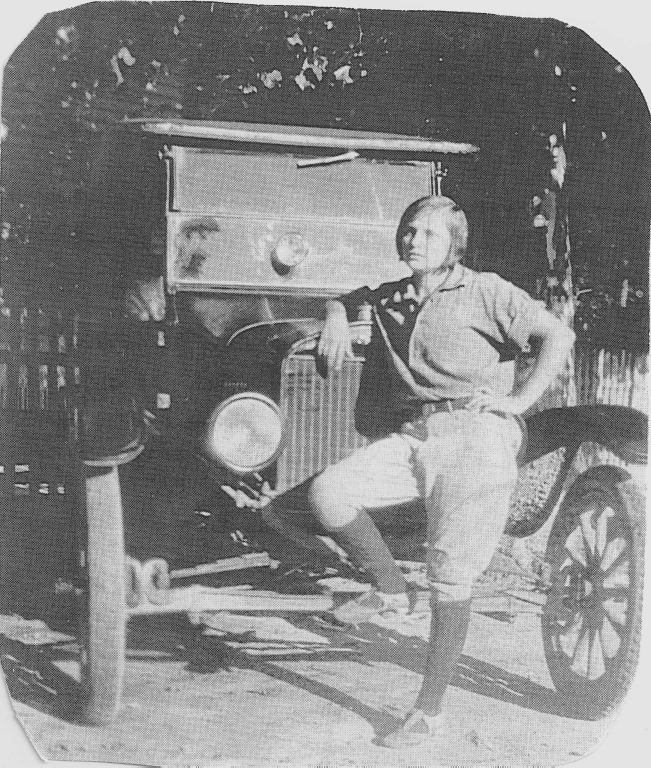 When it came time to go to Tybee, the pastor, as was his habit, asked Georgia to drive one of the cars as there were too many to fit in one vehicle. Well, Frank Wessinger was one put-out young man. He fussed about his uncle inviting “that old girl” to drive! In January 1930, Georgia Olivia Helmley became Mrs. James Franklin Wessinger. Frank married “that old girl,” and they lived happily for almost fifty-one years. Granddaddy passed away in January 1981, a few days before their fifty-first anniversary. Those fifty years were not without sadness. They lost their second child, a boy named Henry, who had been born with hydrocephalus. Granddaddy was diagnosed with lung cancer in 1979. He was in remission when he died. I wish now that I knew more stories about the young Georgia. This is why it is so important to tell the stories. I hope that you will discover the stories of your family. You might find an unexpected flapper in your family!